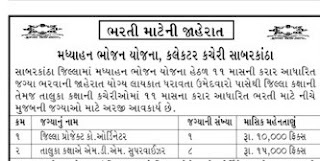 Collectorate District Under Mid Day Meal Scheme - MDM, Sabarkantha published notification for recruitment for District Project Coordinator & MDM Supervisor post on contract bases. View more details about recruitment for e,g, education qualification, Selection process, age limit all are as under. You can view official advertisement by following links. Selection process: Final selection will be based on Interview. How to Apply: Interested and eligible candidates can send their application in prescribed format to below mentioned address along with necessary documents.